3/8" Heavy Duty VSR Drill, Ratcheting Keyless Chuck Offers Greater Bit Retention, 6A Motor, All Ball Bearing Construction Provides Greater Durability & Longer Life, Contoured Textured Handle Provides Better Gripping Surface & Reduces Fatigue. Halfway through a project my cordless drill lost its power. I decided to get a corded drill so I wouldn't have to wait for a battery to charge up (Quite frankly, I think the Ryobai needs a new battery. I decided to go for a new drill instead). This DeWalt is much more powerful than my cordless drill and yet it's also easy to handle. I have a couple of criticisms, however. It's hard to slow it down; when you're trying to make the last couple of turns on a screw, you don't need a high speed. My variable speed cordless drill really allows you to adjust the speed to your needs. Also, drill bits slipped from the chuck a couple of times. My cordless has a keyless chuck and I never had this problem. I haven't owned this drill for very long, however, and I assume that once I've mastered it, I won't have these problems. I needed a drill that was light, powerful and relatively inexpensive. Been using it a couple months for boat building and it is powerful, easy to use with it's light weight and the keyless chuck does not slip. Highly recommended. 5 star tool, needed this for the higher rpm than cordless drills to use with my Kreg pocket hole joinery system. And as always DeWalt delivers. This a great drill. Great for those jobs that your cordless drill can't cover. Great price. This drill fills exactly the requirement I needed--one that works when I need it to work. 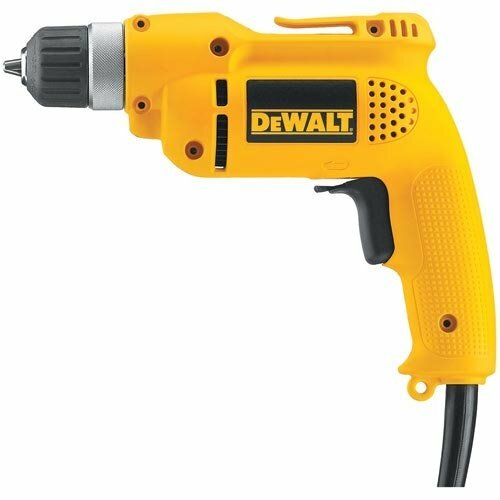 It is powerful and reasonably compact and, though it needs to be connected to an electrical outlet, there are no batteries to fail or need to be charged when the drill is needed. An equivalent battery-powered drill would be much more expensive and, in my experience, much less reliable (NiMh or Li-ion batteries might solve some of the problems with the battery-powered ones). I am very pleased with the quality and performance of the drill. The variable speed trigger is sensitive when using at a very low speed, but with practice one quickly becomes adapt at this. I really like the 2 way level feature for maintaining straight drilling rather then just guessing. The case is a nice item for storing when not in use or for transporting to job site. Powerful drill with easy to use, good-gripping chuck. Bubble level in handle helps to drill vertical or horizontal holes. Speed control is easy to use. The one I got is a bit wobbly, the chuck center isn't quite in-line with the motor or shaft center; so when I use a long bit, the whole unit wobbles quite a lot. I've broken a few bits because of this. I bought this drill because I was tired of my heavy duty cordless drills being dead and having to wait for them to charge to use them. This is a basic 6 amp corded drill with a good jacobs chuck and foward and reverse gears. It comes with a hard shell case for storage. For the price it has held up to my expectations. Pretty good value. Not the most powerful but definitely got the job done. Actually, it may have been my drill bit. I'm happy with the purchase. I received this item and stored it in my closet thinking nothing of it until I decided to use it. Guess what? First time I planned on using it, it was not working. I am greatly disappointed. I bought this tool for my condo in NYC. Didn't bother to return it. I just placed it in the trash. Being my first power tool, I have put this drill through its paces to stunning success. This drill has done duty as the main household drill, a contractors drill driving lag screws 12 hours a day for several weeks, and now, it serves as a powerful tool in my wood shop. This tool is tough. Its been dropped down stairs, on concrete and asphalt, from tops of ladders, its been banged around, beaten up, and never once, has it ever missed a beat. I swear I could run my car over this thing, and still not break it. This tool will last you for a very long time no matter the paces you put it through. Its powerful enough to handle almost any job you could ever ask it to do, and it wont even break a sweat doing it. The ratcheting chuck will hold any drill bit tight from 1/16" to 3/8" without any slippage. It powers through wood, masonry, and concrete. Shoot, if this drill were a person, it'd be Goliath in a David sized package. This tool does have some problems associated with it. This Drill is meant for drilling, and driving, but not much else. There is no such thing as slow and steady with this drill, its either stop or go at 2500 rmp's. This drill is great for those people who feel close counts, but for those who feel the need for precision, this drill is not for you. It is all but impossible to drive #4, #6, and #8 wood screws without either stripping the daylights out of them, or torqueing the heads right off. As for noise level, Dragracers aren't known to be quite, and neither is this drill. All and all, this drill has all of the power you could ever ask in a drill. The lack of a variable speed function severely limits the drills versatility forcing it to be a specialized piece of equipment in your shop. Given the chance to purchase this drill or another drill, I'd still purchase this one. A good buy. Has more power than I anticipated, with little or no vibration. A bit heavier than I thought it would be, but OK. Does not come with drill bits, so I subtracted 1 star. This was a gift for a family member, and they said they used it and liked it. Can't go wrong with a DeWalt....that's why we bought it! I almost did not buy this because of the negative comments about not being able to use this for screwing. To the contrary, by using two fingers on the trigger it is very easy to control the speed for work with screws or for slow drilling. I have used it on several projects for screwing or removing screws. I love this product.